We’re not shy about saying it: Stepping Stone School families are the best! Happily, they say the same about us. 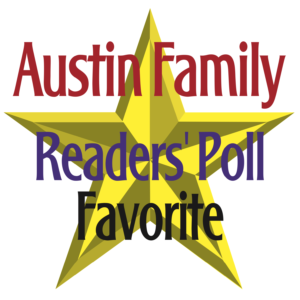 Over the past 35+ years, Central Texas families have entrusted Stepping Stone School with the education and care of more than 50,000 young children and have voted Stepping Stone School the best in childcare for 20 years in Austin Family magazine’s annual readers’ poll. But beyond the numbers and the media are the stories. Here’s a sampling of some in our families’ own words. So we're off to kindergarten - fully prepared! As for further edification of Stepping Stone School and the care and teaching Madison has received - I got the best compliment on your behalf at kindergarten roundup at Tobias Elementary from one of the teachers. When she greeted us and asked Madison where she went for child care and when Madison told her, she said "Oh wonderful! We having nothing to worry about with you -all you kids from Stepping Stone School are fully prepared for kindergarten!" It was a great reminder that not only did we make the right choice but that the teachers in our community have such respect for your program. With our deepest gratitude, we thank you from the bottom of our hearts and will miss you all as Madison moves on to Tobias!! Thank you for being such a huge and important part of our life! We selected Stepping Stone School because of its reputation, curriculum, and awards. We noticed immediate improvements in our son’s social skills, listening, articulation, and happiness. Over the last 6 months, our son has really come into his own. He is comprehending words and phrases faster than we ever thought possible with the help of his teachers at Stepping Stone School. Sometimes we will be out with him and he will surprise us with the new words he has picked up, as we had never taught him that word, so it is clear everything is being done right at his school. While we teach him to be independent and a critical thinker at home, that is built upon at school by the reports we get from his teachers. We're very happy to have chosen Stepping Stone to educate our son. My daughter expresses to me every day that she is excited to attend her School Age classroom. She absolutely loves all of the new friends she has made, the activities and planned projects for her, and most off all her teachers. I really value the organization, attention to detail and the information the school shares with me about my daughter’s day. Not to mention the activities planned for each week to stimulate young minds! The communication and attention to parent requests given by the staff at Stepping Stone School is really commendable. Craig and I really can't put into words how grateful we are that you have been such a big part of CC's life. As I dropped her off at kindergarten, I realized just how blessed we were every day since she was 8 weeks old. I never worried about her, never was sad leaving her or doubted you loved her and protected her. She will always remember Crestview, as will we, and you were such a big part of that! Thank you for taking care of our first baby for the past five years. She and we love you dearly. As for our experiences at Stepping Stone School, we have loved it. Just as important, the kids love it. Max, our oldest, just completed kindergarten readiness and it was exciting to go to his graduation ceremony. Our youngest loved going to school to play with her friends and work on all the different art projects. My wife and I couldn't be happier with Stepping Stone School, it is nice to know how well they are taken care of. They go out of their way to make families feel welcome. The director does an incredible job of organizing family events and appreciation days. She also lovingly cooks all of the delicious fresh meals in the kitchen for the children daily. Sometimes when you walk in the door you can smell the casseroles baking in the oven – amazing! The teachers and staff at Stepping Stone School always give my son smiles and hugs whenever he needs them. These are the qualities that are intangible while researching for care, but vitally important to a child’s sense of security and happiness. When I initially considered enrolling my child at Stepping Stone School my biggest concern was whether the school would continue to help her with her education or just allow her to watch TV, play games, etc. We enrolled our daughter and were very satisfied with the overall service your employees provided for the full five years that she attended your school. Today our daughter is a graduate student at the University of Texas Medical Branch in Galveston. We believe the contiguous education, training and involvement with other children at an early age, played a major role in her development. Thanks again for your excellent service! Our son has really grown to enjoy the school. The experience with Stepping Stone has been nothing but positive. The staff is kind and helpful. The way I describe what I look for in a school is, ‘I’m not saying they should love my child like I do. I ‘m his mother. But I do think they should make him feel that they love him.’ Your school really did that. I know he feel safe and loved with you, Thank you. I love this school. We have 2 children, Boy 5, and girl 10. My Daughter went on to elementary and is such a good student, it’s amazing, all attributed to Stepping Stone School. My son still attends; he has one more year to go before he goes to Public school. He loves his teachers and does not want to go home at the end of the day, he can’t wait to return the next day. We owe you a great deal for teaching our children the skills they need to get to the next level in their young lives. My daughter is also a leader and I am sure that you taught her this valuable skill. I believe that you brought out that extrovert in my son. I am sure he will go a long way with the skills you taught him. Thanks so much! There is no other job more important than being a teacher to a young child. I love to be that person for my son, but since I work I am glad your teachers are there to care for him, to wipe his tears, expand his mind, hold his hand when he is scared and to encourage his most whimsical adventures. Thank you for taking such great care of my 3 children every day. I have been so happy with the care they have received since we started over 2 years ago. I feel as though you are a part of our family. My kids love all of the teachers and talk about them constantly. Everyone is so friendly at drop off and pick up. Some days it is hard to get my 3 out to the car safely, so teachers will offer to help carry them out to the car when their shift is over. If I cannot be home with my own kids every day, I am so happy that we have found this ‘second home’ for them. They love going to school every day!